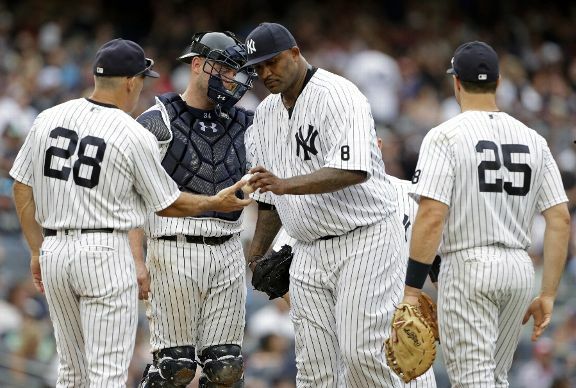 CC Sabathia, looking to get back on track after a couple of rough outings, had no help as the Yankees lost the second game of this weekend’s series against the Red Sox. Sabathia lasted 5 ⅓ innings, surrendering five runs, four of which were earned. The offense for the Bombers failed to show up today, as the team picked up just five hits. Facing a pitcher who had struggled so far this year in Eduardo Rodriguez (1-3, 8.59 ERA coming into today), the Yankees could not capitalize on those struggles. Solo shots by Brett Gardner and Chase Headley were the only scores for the Yankees, who had very few swings that even resulted in hard contact. The only other hard hit balls that I can recall were Gardner’s leadoff single in the first and Didi Gregorius' leadoff double in the fifth. This was the second consecutive night that the offense looked completely lost at the plate. In my last recap, I wrote that I was worried the momentum the Yankees built in Cleveland might disappear during the All-Star break. Sadly, that appears to be exactly what happened. The pitching was far from perfect today, as well. While on the mound, Sabathia gave up nine hits, and at least four of those were soft tappers up the line against the shift. He also had to deal with a pair of throwing errors by Headley and Gregorius. Sabathia had done a great job of working out of those jams until the sixth, when Sandy Leon hammered a three-run homer to make it a 5-1 game. Anthony Swarzak came in to relieve Sabathia, and pitched very well, hurling 2 ⅔ scoreless innings to hold the Red Sox at five runs. With the trade deadline looming, this type of team performance should open the eyes of management and lead them to sell for the future. Tomorrow is the final game of this weekend series with Boston. The Yankees will throw Masahiro Tanaka (6-2, 3.23 ERA) against David Price (9-6, 4.34 ERA). First pitch is set for 8:05 PM ET on ESPN’s Sunday Night Baseball. Lack of run support seems ta be the normal these days.